Embossing: Characters can be embossed on cards to show names and numbers. This is accomplished using a hammer and anvil design for each character which are punched one at a time into the face of a card. In general, 19 digits of the OCR-A font (numbers only) can be embossed on the account number line, and 29 alpha/numeric characters of the Farrington 7b font can be printed on the other lines. Thermal Printing requires a thermal, non-impact, non-embedding printing head containing dot printing elements which are individually and selectively heated and non-heated for the purpose of releasing ink from a foil interposed between the thermal print head and the surface of the card. Over the year many different colors of ribbon have been developed for different uses and looks. Thermal ribbons were also created to apply scratch-off to a card specifically for the purpose of covering a PIN number. 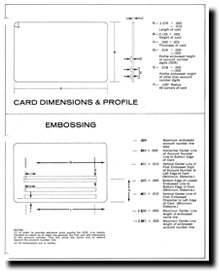 Typically thermal printing can occur anywhere on the plastic surface up to 1/8” from the edge of the card. Inkjet Printing has evolved dramatically in the last 10 years for plastic cards. Originally, magnetic stripe encoding equipment was mated up with MEK (Methyl Ethyl Keytone) or solvent based inkjet printers to provide the first high speed print devices for card production. DOD: The inks consist primarily of acrylic monomers with an initiator package and dries easily by exposing it to strong UV-light. They are dry as soon as they pass under the UV light and can be applied to a wide range of substrates unlike thermal printing which is almost exclusively limited to the higher cost PVC laminated card product. 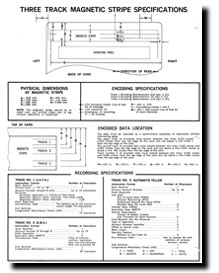 Encoding: Cards often contain a magnetic stripe for the purpose of being swipe read in a magnetic (mag) stripe reader to acquire the cardholder data accurately and quickly. Usually low coercivity magnetic stripes are a light brown color, and high coercivity stripes are nearly black. There are exceptions of course including newer proprietary mag stripe color formulations. High coercivity stripes are resistant to damage from most magnets likely to be owned by consumers. Low coercivity stripes are easily damaged by even a brief contact with a magnetic purse strap or fastener. Laser Imaging: Teslin cards are variably laser imaged in line when printing and then over laminated protecting the variable data UNDER the lamination.